We must act now to disarm it. A collapsed block of ice-rich permafrost along Drew Point, Alaska. Photo credit: Benjamin Jones, USGS. About a fifth of the Northern Hemisphere landmass is permafrost, ground that has been mostly frozen for half a million years or more. Now there are signs of thaw appearing in many places across this vast landscape circling the Arctic, and at accelerated rates. It is only a matter of time until the incremental thawing of the permafrost reaches a tipping point of no return, a state of accelerated and irreversible change, the side effects of which might well push other parts of the Arctic beyond their own tipping points. Quite possibly, we are poised to witness such a transformation within our lifetimes – ice sheet loss, increased frequencies of fires in the tundra and boreal forests, and complete habitat loss for marine mammals, to name just a few examples of the changes that could occur. 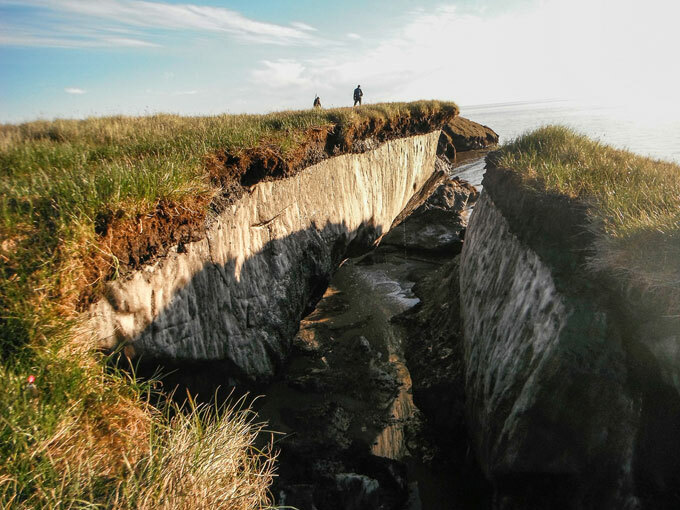 The major side effect of a thawing permafrost is that it will further enhance global warming with the release of large quantities of methane, a potent greenhouse gas. The permafrost contains organic matter, and thawing will enable bacterial decomposition that will release methane as a byproduct of anaerobic respiration. The permafrost is not the only climatic system that is susceptible to abrupt regime shifts – the Greenland Ice Sheet, the West Antarctic Ice sheet, and numerous ice shelves in both hemispheres have the potential to undergo abrupt and irreversible change in their state. However, the permafrost is likely one of the fastest to respond, given its southward extent and the existence of positive feedback loops – vicious circles that can amplify the thawing initiated by human-caused warming. The question is, where is the tipping point? The past history of permafrost thawing might give a few clues. During the last two million years, the climate has periodically shifted between cold (glacial) and warm (interglacial) states. We are currently in an interglacial that began about 11,000 years ago. Not coincidentally, the beginning of this warm stable period marked the dawn of agrarian societies and complex human civilizations. The glacial cycles were driven by changes in Earth’s axial tilt, which slightly altered the distribution of solar energy across latitudes. The small variations in incoming energy was amplified by internal feedbacks within the climate – feedbacks from growing and retreating ice sheets, sea ice extent, and large scale changes in ocean circulation, for example. Through the repeated bouts of glaciation, large ice sheets waxed and waned over North America and Eurasia. However, significant portions of the ground frozen during the glacial phases persisted through multiple interglacial cycles up to the present day, their thaw slowed down by insulating layers of soil. The last time there was a large-scale thaw of the permafrost was four interglacials ago. Evidence of this thawing event can be found in Siberian caves where stalactites and stalagmites growth last occurred at that time. Such deposits can only form when there is liquid water flowing. At the time of the thaw, about 450,000 years ago, the climate was about 1.5°C warmer than pre-industrial temperatures. Today, the temperature is nearly as warm – 1°C hotter than in pre-industrial times. Even more worrisome is the rate of the current warming, unprecedented in over 50 million years of geological history. It’s worth noting that the principal goal of the Paris Agreement is to limit global warming to 2°C above pre-industrial levels by the end of the century. In part, the value of 2°C derives from evidence – such as that found in the Siberian caves – that predict tipping points at or beyond that threshold. However, it is possible that a tipping of the permafrost may not happen at a specific temperature threshold, but would rather depend on the rate of human-caused warming. That scenario is an extension of the “Compost Bomb instability” model proposed in 2010 by a team led by mathematician Sebastian Wieczorek. Wieczorek’s team modeled peatlands, which have large carbon reservoirs like the permafrost. Their model predicted that decomposition of that organic matter, once initiated, would become a source of heat itself, causing an explosive increase in soil temperatures, additional decomposition, and methane release. Crucially, the higher the rate of global warming, the sooner the tipping point could take place. Simulation of ground temperatures in the ‘compost bomb’ model. Above a certain rate of global warming, v, the model predicts an explosive increase in soil temperatures due to heat generated from bacterial decomposition. The higher the global warming rate the sooner the tipping takes place. There are good reasons to suspect that this would also be true for the permafrost, which like the peatlands would have the same capacity to generate internal heat due to bacterial decomposition of organic matter. If so, we might expect a tipping before reaching the 1.5°C limit as was the case for the last thaw 450,000 years ago. A principal difficulty in modeling and predicting tipping points is the inclusion of positive feedbacks. By their nature, they tend to “blow up” due to exponential growths, especially if the physics of those processes aren’t known with great certainty. For this reason, climate scientists often err on the side of caution and do not include many of them in climate models. The IPCC projections, for example, do not include feedbacks from the permafrost. As a result, climate predictions often underestimate future warming. Consider a recent study which finds that the models which do the best job at simulating the recent past predict greater future warming. In other words, models that predict the greatest future warming are very likely the most accurate. So it might turn out that the goals set forth by the Paris Agreement are not sufficient. Indeed, there are telltale signs that the permafrost is already tipping across the Arctic. The Global Terrestrial Network for Permafrost makes available temperature data from hundreds of boreholes across the Arctic. 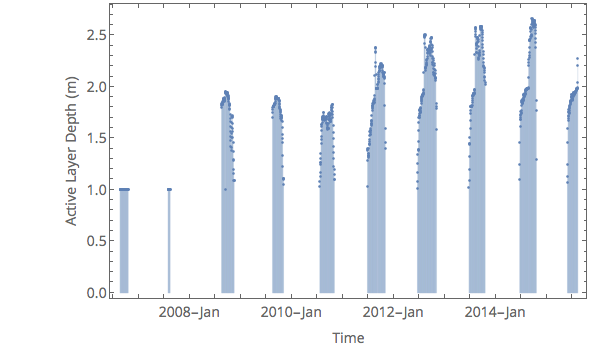 Analysis of the data reveals that in many places, the thickness of the seasonally thawed upper layer increased significantly between 2009 and 2015, the end points of a large number of datasets. Temperature profiles with time at two borehole locations in Siberia, Bolvansky 59 and Olsky pass-6. The trends show seasonal variations as well as a steady upward drift in temperatures through the period of observations. Analysis and figures by by Raj Saha. Ground temperatures at shallow depths show large seasonal variations, warming during the summer months and cooling in winter. In many places, particularly at lower latitudes, temperatures near the surface of the permafrost go above freezing. This is the “active layer”, so called on account of the biological activity, vegetation and microbial growth, the thawing initiates. Temperatures at greater depths respond much more slowly, being insulated by the overlaying permafrost, and typically do not change appreciably. However, at many borehole sites, heat is observed to be steadily penetrating into the depths, aided by warming trends in surface temperatures and percolating meltwater from the upper layers. As a result, the permafrost landscape is starting to show signs of a dramatic transformation. Variations in the thickness of active layer with time at the borehole sites above. Analysis and figures by Raj Saha. Thermokarst lakes, formed from the collapse of thawing ground, are appearing at accelerated rates in Alaska and in the Canadian Arctic. Large number of gas emission craters are appearing in Siberia. Methane emissions measured from degrading permafrost on land and subsea continental shelves are increasing. The U.S. Geological Survey estimates that 16-24 percent of the Alaskan permafrost will degrade by 2100. Since 2007, there have been reports of increasing numbers of fires in the tundra and boreal forests, at rates that are unprecedented in the last 10,000 years. The meltwater from the already underway thaw and the fires could work together to speed up permafrost thaw even more. The picture emerging is that the Arctic is full of positive feedback mechanisms that can work together to amplify warming. In fact, this is already evident in the amplified warming of the Arctic relative to the rest of the world. Variations in the mean temperature across latitudes between 1880-2015. 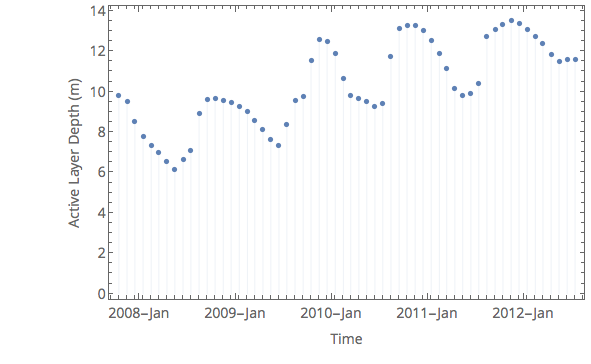 The blue line is the annual mean and the gray area depicts the max/min monthly variations. Data source: NASA GISS Surface Temperature Analysis. Visualization by Raj Saha. While it is difficult to quantitatively pinpoint when a system is about to undergo tipping (though some studies have outlined definite criteria), it is likely a decent guess to speculate that the permafrost, and indeed the Arctic as a whole, is already at or very near a tipping point. The basis for such a claim is the simultaneous shift towards tipping points in a number of interconnected systems, many of which are positive reinforcing feedback mechanisms. Is it too late to prevent a regime shift in the Arctic? Possibly. That by no means implies that we might as well sit back and continue with the “business-as-usual” agenda. While it is a certainty that Arctic systems like the permafrost are susceptible to tipping, it is also likely that the thresholds are sensitive to rates of human-caused greenhouse emissions. By acting now, and on a frantic global scale, we just might be able to delay the tipping and the climatic domino effect from taking hold. Even if a tipping is inevitable, we might be able to prevent further degradation of the last of pristine environments left on Earth and the rich and intricate ecosystems it supports. It’s a no-brainer that we need to reduce and cut emissions, and there are many studies that provide directives and roadmaps for how we should proceed. One such study, by the Stockholm Resilience Institute, proposes a set of multi-decadal efforts on global scales to meet the goals of the Paris Agreement. That’s a start, though a “Herculean” undertaking in itself, as the authors put it. We also need specific policies aimed at the protection of the entire Arctic, not just limited to the Arctic National Wildlife Refuge. This means stopping any and all kinds of resource extraction – oil, natural gas, shale oil, and heavily restricting and regulating trans-Arctic shipping and tourism, all of which have seen a boom in recent years due to the access made possible by receding sea ice. At the same time, we need policies to support indigenous communities of the Arctic whose lives have been the most affected by the changing environment. Some communities are being displaced right now due to coastal erosion. Some have become entirely reliant on tourism to support their economies. Protection and empowerment of the peoples of the Arctic is a must. It’s time we start accepting that climate change is here, not something waiting to happen in some hypothetical future. By acting now we have some chance of disarming the ticking permafrost bomb. Raj Saha studies climate dynamics and teaches climate and mathematical modeling at Bates College.